Ten Things The Hillywood Show Got Right with Supernatural Parody 2! I’ve been a fan of the Hillywood Show since I discovered their parody videos with their first Supernatural video several years ago. Hannah and Hilly Hindi, the sisters behind The Hillywood Show, were kind enough to chat with me about that video and to also contribute some insights to the documentary film on fandom I co-wrote, Squee! I’ve been eagerly awaiting their second Supernatural parody with high expectations, but the reality surpassed them when it was released last week – Supernatural Parody 2 is a loving tribute to the show, its amazing cast, and its incredible fandom. 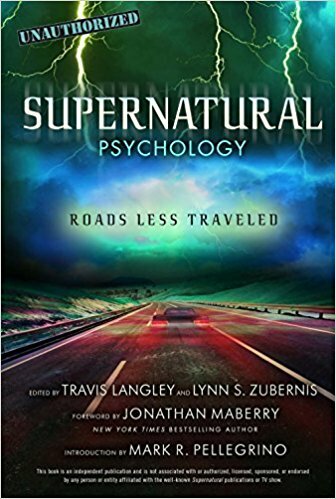 As I took some notes on why I was enjoying it so much, I realized it’s because once again, they totally got it right – even for someone like me, who adores Supernatural and has written five books on the show and the fandom! 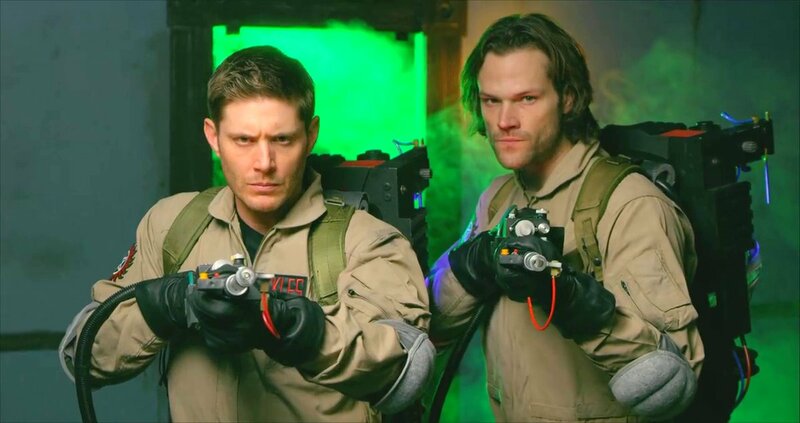 I was at the Supernatural convention in Denver last weekend, and there was quite a bit of talk about the new parody, which both fans and Supernatural stars Jared Padalecki and Jensen Ackles had high praise for. 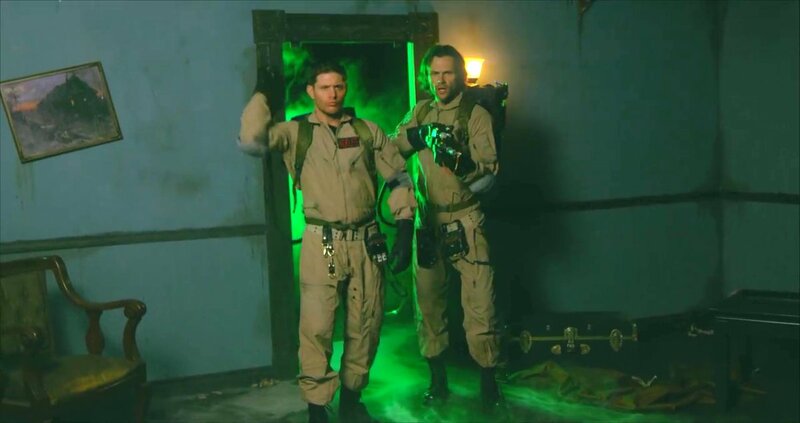 Jensen in particular was impressed with the production value and the professionalism of the set and the shoot, and especially with the realistic proton packs that he and Jared got to wear – they sometimes had to take them off between takes because Jared kept bumping into the door and other things. Jensen seemed excited that the blasters really worked too, which I think means they were having a lot of fun playing with them! I shared those reactions with Hannah and Hilly when we chatted. Hilly: He did keep bumping into the door, we can confirm that one. Hannah: I just know that Jared really likes to push buttons! Hilly: The pack, though, really was the coolest toy. They were like the real deal, so it’s the ultimate toy and Jared was like, yes! I could just see his eyes light up. [There’s a great moment on the behind the scenes feature where Osric shows Jensen how to pull out his blaster, and he does. Then Jared pulls out his, with significantly more flourish, and Osric grins and whispers to the camera. I laughed out loud at that. Hilly: We haven’t been able to talk about it or hear from them since the shoot. They asked, “When can we mention it?” I told them you can’t until the video is out. So, weeks down the road now, it’s really cool to hear them talk about it. Lynn: They definitely enjoyed it. So, after thinking about this a bit, I’ve identified ten things you got very right. I’m gonna go through them one by one, and you can comment, okay? Number 1. One of the things that makes your parodies so brilliant and so loved by fans is that you really GET the show you’re parodying, maybe Supernatural more than even the other shows you’ve parodied. You were able to reproduce the show itself with the level of detail that fandom relishes – the kitchen set from Changing Channels, the library in the Men of Letters bunker, the proton packs with Dean’s little army man and the Colt and Sam’s with Ruby’s knife. Some of the scenes looked so eerily similar, like that iconic moment when Dean fires the Colt and kills Azazel in slow motion. How do you decide what scenes and what details to include and how much detail to put into it? It must take so much time!